The Antlers at Vail hotel offers a unique Vail lodging experience in an incomparable setting on beautiful Gore Creek, in Lionshead facing Vail Ski Resort. Just 150 yards from Vail’s Lionshead Gondola and footsteps from the free in-town shuttle, this Vail hotel is conveniently located to Vail Colorado’s shopping, restaurants and nightlife. Ranging from studio suites to four bedroom vacation homes, all spacious condo rentals include a full kitchen, private balcony, daily housekeeping, complimentary WiFi, and much more. Enjoy a crackling fire in your living room fireplace, admire the view from your private balcony or relax in the picturesque pool or hot tubs located on the banks of the Gore Creek. On-site ski rentals and complimentary ski valet during the winter will top off your Vail ski vacation experience at this Vail hotel. In addition to being awarded Vail’s highest-level Platinum lodging rating, the TripAdvisor Certificate of Excellence and GreenLeader status, Antlers at Vail hotel was recently named a “Best Ski Hotel for Families” by Curbed Ski. Everyone from families to couples will enjoy the Antlers at Vail hotel’s spacious condominium suites, fantastic Vail location and long list of complimentary amenities, including loaner snowshoes and GoPro cameras, DVD players in each unit with hundreds of movies available, unique appliance loaners – espresso machines, waffle makers, blenders, toaster ovens, crock pots, rice steamers – for home-cooked family meals, and of course, the heated outdoor pool with hot tubs and WiFi. 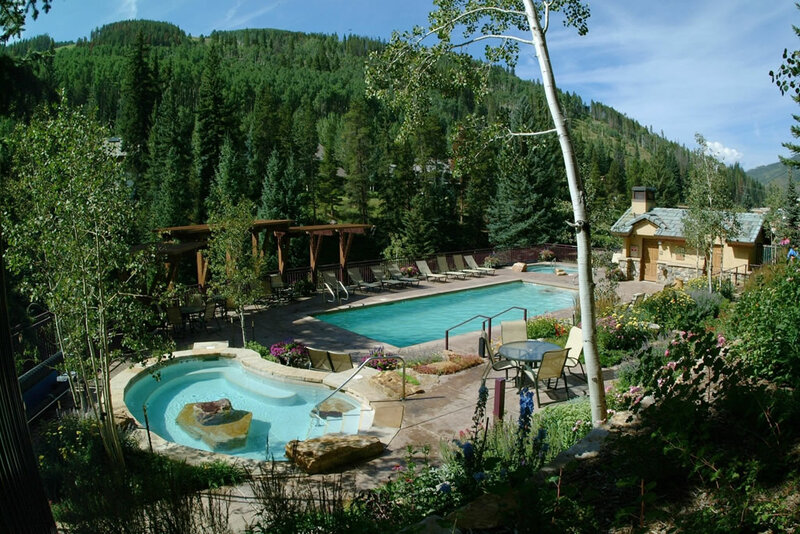 The Antlers at Vail conference facilities include beautiful outdoor landscaped areas surrounding the creekside pool and hot tubs, in addition to indoor conference space with natural light, ideal for up to 100 attendees and a executive board room for more intimate meetings. A state-of-the-art AV system is included. Make your next Vail vacation or meeting an effortless and special one by letting the friendly Antlers’ staff welcome you to their family!